I was 39+3 with my second daughter when I was feeling my belly and noticed she was 100% transverse in my belly! 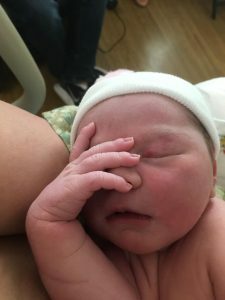 I had a vaginal Hypnobabies birth planned so became nervous and called my doctor. The following day I went in for an ultrasound and it was confirmed she was transverse (Laying horizontally). Because I was close to birthing time (Hypnobabies word for labor), and because she was so high with cord presentation, it was decided Scarlett would be born by c-section that night. I was not at all prepared for this and was very emotional. I employed my Bubble of Peace (Hypnobabies technique for remaining calm) and kept repeating the affirmation in my head that this baby has her own birth story and she will be born the way she was meant to. Because I had eaten, I would have to wait 8 hours for surgery. 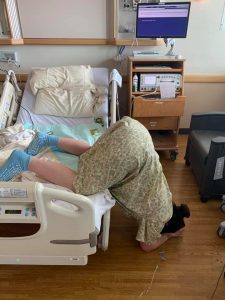 During that time in the hospital, I did some Spinning Babies techniques (until the doctor became uncomfortable and asked me to stop), used heat and ice packs, and finally remembered to listen to the Turn Your Breech Baby Hypnobabies track. During the track she was moving like crazy, finally settled down, and I felt a pressure wave (Hypnobabies word for contraction)! It turns out, she had moved and was head down immediately prior to surgery. We decided to proceed with induction rather than risk her turning again, and I was moved to a birthing room. On admission, I was 2cm/50% so Cervidil was placed for the night. I had nice, consistent pressure waves all night and used my Hypnobabies tracks to help me sleep, feel peaceful and ready. The next morning, I was 3cm/60% and Pitocin was started. I was feeling very anxious about starting the Pitocin based on my prior experience with it but found this time I had a much much easier time with my pressure waves. I did not employ Hypnobabies the way I had intended (by listening to my hypnosis tracks), simply because I felt full of energy and knew it would be a long road ahead. I did not feel ready to commit to listening to the hypnosis tracks for the next potentially 12 hours. I did consistently use all my Hypnobabies hypnosis tools in my own mind to self-deliver self-hypnosis cues and techniques, keep my body loose and limp through pressure waves, and find joy and peace in the process. Around 11:30 am I decided to lay down and rest to a Hypnobabies hypnosis track. My waves were consistent but short and I did not feel any increase in pressure intensity, so I began listening to Come Out Baby (a Hypnobabies hypnosis track to encourage baby to be born. I had purchased this the day prior while trying to encourage Scarlett to get into position. since I had not purchased the track to make waves stronger, I thought this could encourage her and me to work together and have my body take over my birthing time) and wouldn’t you know it, less than 15 minutes later my water released spontaneously! Nice, clear fluid. I was so happy and looking forward to this next step in our journey. Finally, pressure waves picked up in strength and I felt so close to meeting our new baby. At 1:30 pm, I was still up walking, talking, moving and swaying between waves, but had to pause and turn my light switch off (Hypnobabies technique to enter hypnosis) during each one to let my body do what it needed. It was at this point I decided to get an epidural. I knew I wasn’t employing my hypnosis and hypno-anesthesia the way I was supposed to and would not get the most benefit from it. I did use my tools to get through the procedure peacefully and easily. Following the epidural, I was 5cm/60%. I rested and listened to hypnosis tracks until 3:45 when I was checked again and found to be 6cm/60% and Scarlett was at +1 station. I again rested for about 30 minutes and began feeling a little bit of pressure. At 4:21 pm I was 10/100%/+2 and began to push. Everything happened quickly and I didn’t get to listen to Pushing Baby Out (Hypnobabies hypnosis track just for pushing). 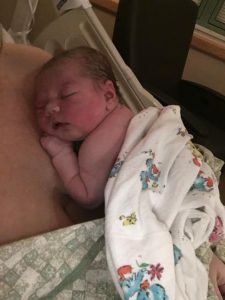 Even with a 30-second shoulder dystocia, Scarlett Kate was born at 4:31 pm on 3/26 very easily and comfortably. She is doing wonderfully, we are so happy and excited for her to meet her big sister and join our family.